The Baron was intrigued with how to make churros from scratch so he joined me in the kitchen to help. Preparing these together has to be one of the most fun times we had in the kitchen so far. I'm *still* laughing to myself about that night! After making the dough and transferring it to a pastry bag, frying the short strips proved to be quite comical. 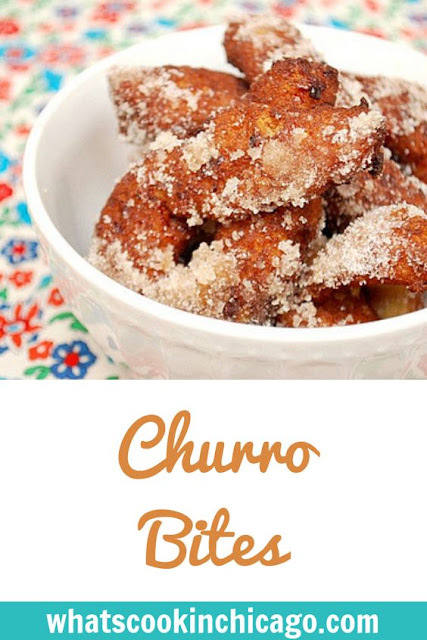 From inconsistent strips of frying dough, uncooked dough rolled in cinnamon sugar and trying to explain how these are made while keeping a straight face, we managed to get a bowl full of Churro Bites done. We enjoyed these drizzled with caramel sauce or dipped in a hot chocolate sauce. Actually, any ice cream sauce would do! In a small saucepan over medium heat, combine water, sugar, salt and 2 tablespoons of vegetable oil. Bring to a boil and remove from heat. Stir in the flour until the mixture forms into a ball and pulls away from the side of the saucepan. Transfer mixture to a pastry bag fitted with a large tip or a plastic storage bag with a corner snipped off. Heat up the cooking oil in a deep fryer or deep skillet to 375 degees. When the oil is hot, pipe short strips of dough into the hot oil using the pastry/storage bag. Fry until golden and drain on paper towels. Combine the sugar and cinnamon coating together in a shallow container. 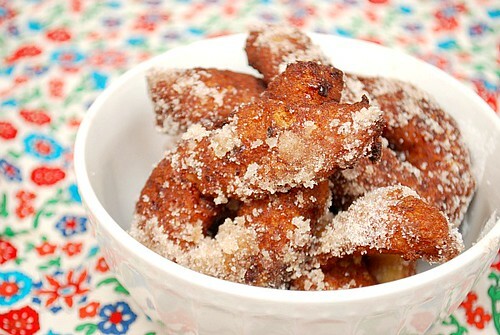 While still hot, toss the cooked churros into the cinnamon sugar to coat.